Travelling across Romania, the ghost of Nicolae Ceaușescu is always present. 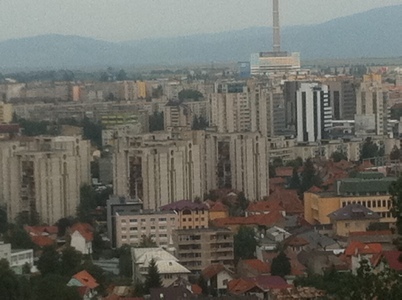 In town after town we drove through we found the hallmarks of the communist dictator’s stamp on urban planning – grimy, shoe-box apartment blocks within easy reach of equally grotty industrial estates. During a nine-day trip to Romania with friends, we saw this evidence from the past close-up in Fagaras, in the heart of Transylvania, where we had to venture past the walled compounds of chemical plants to get from the town to our hotel in an idyllic location besides a lake. For over 20 years, from 1967 to his removal in 1989, Ceaușescu ruled as head of state with a somewhat devastating impact on its people. In what was termed “systemisation” whole villages were cleared, with people moved to live in monolithic towns where they worked in heavy industry. 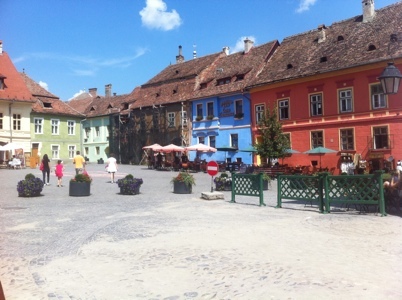 Some medieval quarters, like the centre of Brasov, escaped the communist bulldozer. But, even in this charming town with its historic ramparts, ugly tower blocks can be seen in the distance if, as we did, you clamber high up to the Citadel. And even away from the urban centres, Ceaușescu also left his mark in the countryside. As we hiked for four days through the wonderful Fagaras mountains where the terrain varied from Alpine forests to more rugged landscapes higher up, we encountered a number of stray dogs. Many of these animals, which potentially have rabies, are descendants from the guard dogs that were abandoned when vast numbers of people were forced into apartments. But despite the negative image we have of Ceaușescu, he wasn’t always unloved. Thanks to his independent foreign policy which challenged the supremacy of the Soviet Union, Ceaușescu was at first a popular figure in Romania and the West. He not only refused to take part in the 1968 invasion of Czechoslovakia by Warsaw Pact forces, but actively and openly condemned that action and travelled to Prague to support president Alexander Dubcek. Over time however Ceaușescu tightened his grip on power and, during the 1980s, there was a steady decrease in the Romanian population’s standard of living, especially in the availability and quality of food and general goods in shops. As the people fought for their survival, the dictator ordered the export of much of the country’s agricultural and industrial production in order to repay its foreign debts. With the population starving, heating, gas and electricity blackouts became the norm. All but one television channel, broadcasting for only two hours a day, was closed down. Given the struggles they faced in their daily lives, it was inevitable that the people would rise up and call for the head of Ceaușescu. In the capital, Bucharest, last weekend, we saw the balcony where after giving a speech in December 1989 he needed to be evacuated by helicopter due to protests. On Christmas day of that year he and his wife Elena was executed by a firing squad. 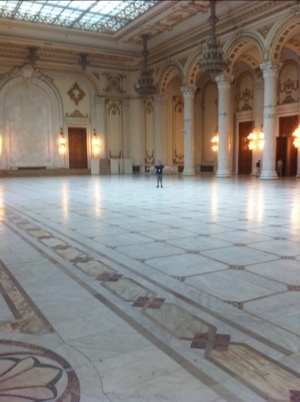 Before leaving Romania, we visited the vast palace that Ceaușescu ordered to be built near the centre of the capital, forcing 10,000 people to be made homeless. Today, it stands as the second largest building in the world after the Pentagon, but if he’d had it his way it would have been a lot larger – he was killed before it could have been completed. Ceaușescu enlisted 700 architects to create a vast complex where he envisaged bringing all of his ministries together, thus tightening his grip on power, alongside theatres, ballrooms and luxurious apartments for him and his wife. Even before it was finished more than £4bn was spent on building the palace. No-one knows exactly what it is worth today. More than 20 years on from the departure of Ceaușescu, the building is still in use – housing the national parliament and a number of other official offices. But what strikes me most is how the lavish interiors stand in stark contrast to the lives that many Romanians face today (high levels of unemployment and less than 50% of people having access to running water). With such inequality, Ceaușescu’s ghost really does continue to haunt.